St John's gospel, written long after the other three gospels, is a meditation upon the events of the Saviour's life filled with Resurrection light. It is not surprising, therefore, that the gospel readings for the Sundays of the Easter season are from the fourth gospel. Today's readings are a celebration of the Resurrection faith that makes it possible to know and enter into the Paschal Mystery. They come to a climax with the story of how the original ‘doubting Thomas’ found faith. This gospel invites us to share the experience of the disciples, finding faith through the coming of the Lord into their midst on the evening of his Resurrection Day. What a dramatic situation – they are to meet the one whom they have deserted and abandoned to his fate. There is no word of reproach, no reference to what has taken place, only ‘Peace be with you’ and again ‘Peace be with you’ – you are forgiven come once more into my friendship. Their finding faith is a meeting with God's generous and reconciling love. And he sends them forth with the good news of the forgiveness of sins. For many faith does not come easy and they are helped by the testimony that echoes down through the centuries of hard headed Thomas - as he owns that it is indeed the crucified one - the one who shared the deepest darkness of the world we have made – to whom we can entrust ourselves, as our ‘Lord’ and our ‘God’. 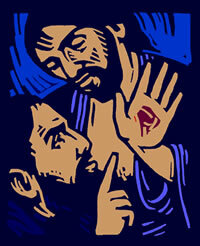 The Resurrection faith today's liturgy celebrates is a faith which must find expression in action. The reading from Acts describes the first community of Christian faith, no longer a group of discouraged and disillusioned followers, but galvanised into action: sustained by the power of the apostles' witness, united in heart and soul, sharing what they had with those in need. The apostolic witness and preaching are echoed for us in the reading from John's first letter. The faith that unites believers in the Resurrection is a ‘victory’ – not a victory achieved by violence and power, but the triumph that belongs to those who have truly learned the ways of the Risen Lord – whose greeting was ‘Peace’ and the forgiveness of sins. Authentic Resurrection faith awakens a sense of responsibility and brings a call to mission: ‘As the Father sent me, so am I sending you’.